If you take pride in your work, a hard worker and a team player… we are looking for you! If you don’t feel you are qualified for a specific position, please keep in mind we are willing to train the right person for each open position. Tired of the big-city rat race? The traffic? The high cost of living? Come to beautiful Anacortes, the launching point to the San Juan Islands! We have jobs for you!Marine Servicenter, a full-service boatyard in Anacortes, WA, is seeking an experienced marine mechanic. Experience is preferred, but some training available on site. The qualified candidate should have experience in the repair, service, and installation of diesel and/or gasoline engines, their associated powertrains including shafts, outdrives, saildrives, and steering systems. Duties will also include service and installation of water, fuel, and sanitation systems. Manufacturer’s certifications are a plus; Yanmar, Cummins, Volvo, etc. Working in a team environment, we work on 20 to 60 foot sail and power boats. In addition to working at the boatyard, you can expect to repair and service existing customers’ boats in the multiple marinas in Anacortes. Having been in business since 1977, we know that teamwork is an important part of any successful business, and we are searching for just the right mechanic to round out our team. Please email for full job description. Tired of the big-city rat race? The traffic? The high cost of living? Come to beautiful Anacortes, the launching point to the San Juan Islands! We have jobs for you! 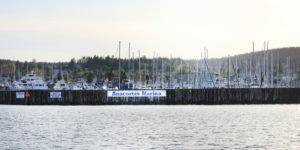 Marine Servicenter, a full service boatyard in Anacortes, is seeking experienced marine electricians. Yacht systems electrical and electronics certifications as a marine electronics installer or electrical certification by ABYC are a plus. Working in a team environment, we do custom installations of navigation, communication, sonar, entertainment, computer, and service systems on pleasure yachts from 20 to 60 feet, sail and power. In addition, you can expect to be assigned to repair and servicing of our existing customers’ boats in the Anacortes area. NMEA 2000 experience and certifications a major plus! Having been in business since 1977, we know that teamwork is an important part of any successful business, and we are searching for just the right electrician to round out our team. Required education: No requirement, but prefer some college or trade school experience. NMEA certifications a major plus! Marine Servicenter, a full service boatyard in Anacortes, is seeking an experienced welder and fabricator to join the team and get to work on a number of high-end custom projects. Working in a team environment, we do custom installations of navigation, communication, sonar, entertainment, computer, and service systems on pleasure yachts from 20 to 60+ feet, sail and power. In addition to fabricating custom davits, swim platforms, radar arches, solar installations, and pulpits, you can expect to be assigned to the repair and servicing of our existing customers’ boats in the Anacortes area. We are a team here at Marine Servicenter. If you want to be apart of that team, you must have good work ethic, be reliable, and be an outstanding person. We are willing to train the right people, but we want them to WANT to move up and learn new skills and trades. Please submit your applications even if you do not see a current open position that fits you. We are always looking for good people, and regularly call applicants.